You?re a prime candidate for acquiring Achilles Tendonitis if you?re a runner or some other kind of athlete requiring heavy use of your calves and their attached tendons. Then again, -anybody- can get tendonitis of the Achilles tendons. All for very predictable reasons. 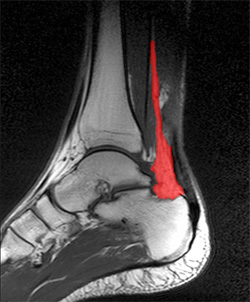 Perhaps you have Achilles Tendon pain from cycling. Or standing at work. Or walking around a lot. Anything we do on our feet uses our lower leg structures, and the Achilles tendon bears LOTS of torque, force, load, etc. The physical dynamic called Tendonitis can show up anywhere. On the Achilles Tendon is as good a place as any. Repetitive strain injury can show up anywhere in the body that there is repetitive strain. It's an obvious statement, but worth paying attention to.